I've been looking at a lot of smart home stuff recently and having fun with things like the Philips Hue and cheer lights. Ironically one of the best features of Hue is its light switch! It shouldn't come as much as a surprise that the best way to turn lights on and off is with a switch! Taking your phone out of your pocket is way too clunky. Even using Siri on Apple Watch you need to press the button and say "turn on the lights", when you could just press a button in the first place! That's not to say Hue isn't really great - it is really great (and addictive and expensive! ), but the best bits are having lights turn off automatically in rooms you're not using, being able to dim them exactly as you want, and turning on and off lamps from the switch by the door. Seriously that lamp in the far corner will see a lot more use when you don't have to turn on the main lights, walk across the room, turn it on, walk back then turn off the main light, then walk back and sit down! (then repeat when its time to leave). Most of the cool tricks involve being able to control the lights in more flexible ways in addition to just a basic switch (and the ability to place that switch anywhere). What we need is a motorised pot - which is exactly what it sounds like: a Pot with a motor attached. These can be quite expensive, but I found a cheap source on eBay and picked one up for about £3. Signal just connects to any analog in, and we can read the position of the pot. 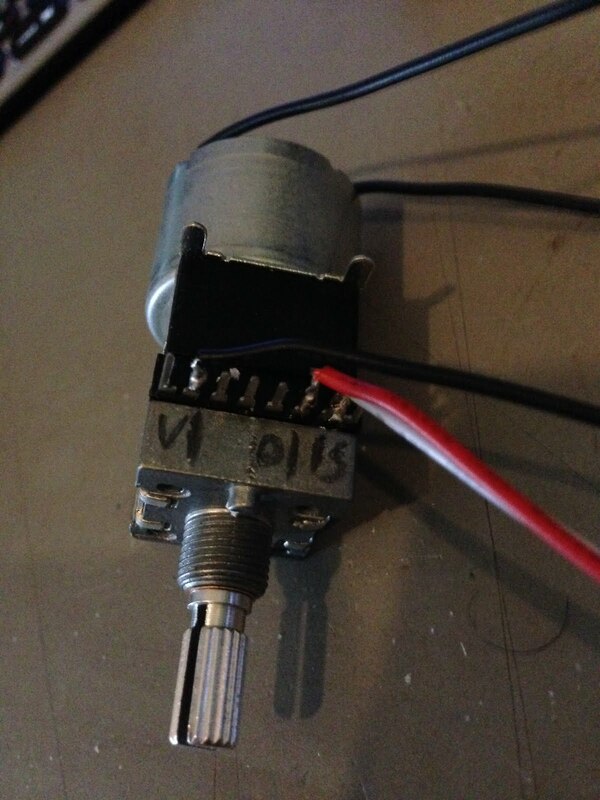 Hooking up the motor is simple but requires a motor driver. I could have used a motor shield, but I had some stand alone boards around. We don't need much power, so I just powered the motor board from the 5V of the Arduino. 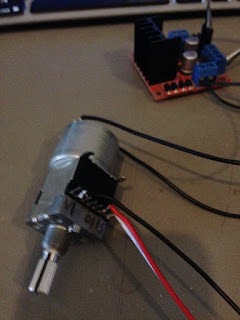 Connect the motor wires to the outputs of the board, and then connect two wires from Arduino digital pins to the control pins of the motor board. We've made a loop, and we keep going round the loop until the difference between the desired and actual values are less than 0.01. We use abs because we don't care if the difference is positive or negative. The contents of the loop might look a bit odd, but its really pretty simple. When ever we use a greater than (or less than) its actually testing something to see if its true or false, so the answer to the question "is targetDial>dial" is either a yes or a no. So if targetDial is bigger than the actual position (dial) then we set motorCW to yes, and the motor turns clockwise. If it isn't then motorCW becomes no, but motorCCW probably becomes less and we turn the pot CCW. This will keep adjusting the dial until it reaches the target position. The neat thing is that if it overshoots, then it will adjust back the other way automatically, until its in exactly the right position and the loop exits. Then we turn the motor off, and we're done. To test the adjustDial script I wrote the start script above. It picks a random value between 0 and 1, and adjusts the dial to that position. It then waits 5 seconds (during which you can turn the dial manually) before starting over again.